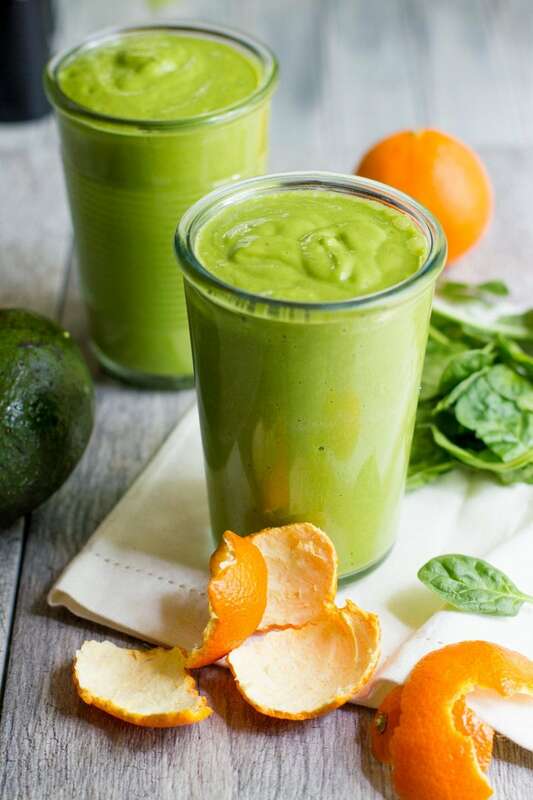 This bright and citrusy Clementine Avocado Smoothie is perfect for a morning pick-me-up. Don’t be afraid of the avocado! It’s tasteless and adds a wonderful, creamy texture. Happy Thursday, friends! I’m so happy to be back again this week with another fruit- and veggie-packed recipe spotlighting some tasty produce from Pink Ribbon Produce and Meijer. I’m pretty stoked to show off two of my favorite items from the produce section in one smoothie—clementines and avocados! If you think an avocado smoothie is weird, I’m here to change your mind. Avocado adds an amazing amount of creaminess, richness, and healthy fats (which helps make your smoothie more filling), and it barely has any taste at all. Try it! I promise you’ll never want another avocado-less smoothie again. 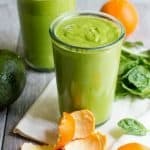 This avocado smoothie packs in three Pink Ribbon Produce partners in one glass—juicy clementines from DNE World Fruit, tasty avocados from Avocados From Mexico, and tender and sweet baby spinach from Dole Salads. If you missed last week’s kick-off post on my partnership with Pink Ribbon Produce, let me give you a quick overview of their mission. During the month of October, when all of our minds are focused on Breast Cancer Awareness, Pink Ribbon Produce helps inform folks what eating a healthy diet can do to help prevent cancer, all while raising money for their research parter—the National Breast Cancer Foundation. Pink Ribbon Produce partners with fruit and vegetable growers along with major supermarket chains to team up to help fight breast cancer through nutritional education and fundraising for cure research. Educating the public on the importance of a healthy diet and raising cash to help fight breast cancer? That’s a win-win in my book. If you think you are helpless when it comes to lowering your cancer risk, you’ll be happy to know that you have some power in this fight! The American Cancer Society says that, besides quitting smoking, eating a healthy diet rich in plant-based foods is one of the most important things we can do to help prevent cancer. 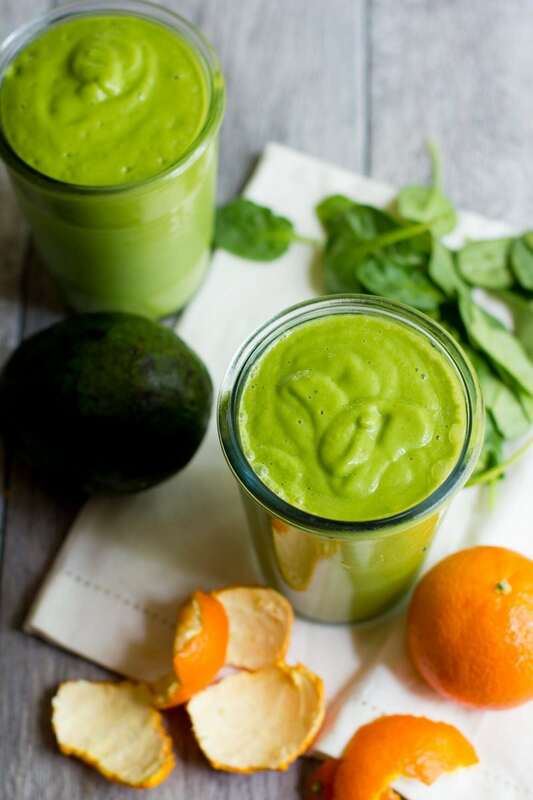 The ACS recommends getting at least 2 1/2 cups of fruits and veggies a day, and green smoothies like this one are a wonderful way to pack in a lot of produce in an easy-to-eat, tasty treat. 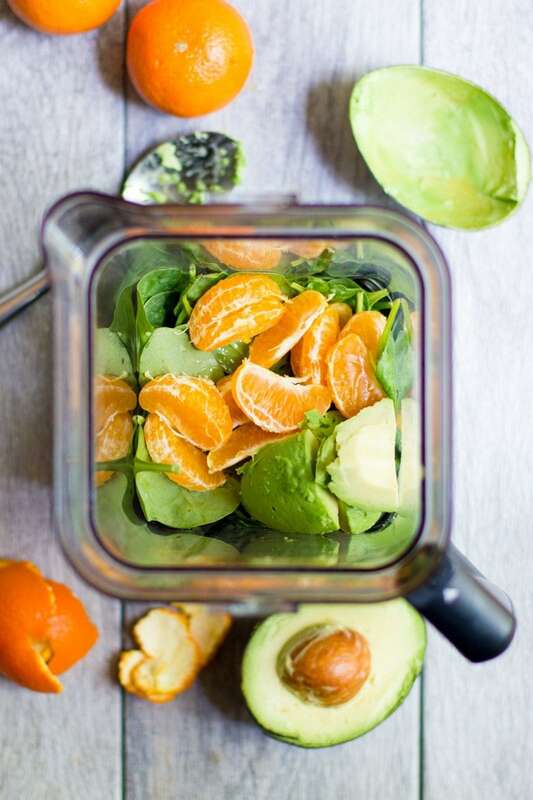 For each one of these smoothies you drink, you are getting in one clementine, a half avocado, a half banana, and a cup of spinach—that right there is four servings of fruits and vegetables! You’ll almost hit that 2 1/2 cup mark just with one drink! 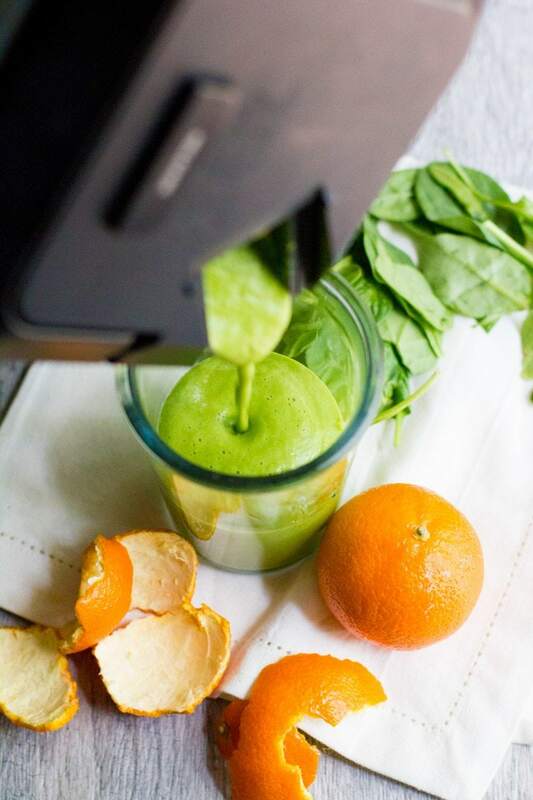 This smoothie has a bright, citrusy flavor, and is the perfect way to wake up your morning. If you’re feeling a touch under-the-weather, this smoothie would be a great way to help bolster your immune system to fight off the yuck—it clocks in at over 200% if your RDA of Vitamin C per serving. And, if your throat is scratchy, this cool and creamy smoothie feels wonderful going down. I get really picky about the foods I eat when my throat has that tickle, and this smoothie always makes the list of winners. Oh, and I said I would convince you to try avocado in your smoothie! DO IT. Even if you aren’t an avocado fan, the texture of the smoothie is so wonderful, you’ll be completely on board! And, like I said, it can add some much needed fats and healthy calories to smoothies that are normally too low calorie and lacking in fat to really satisfy. Adding avocado to a smoothie turns it into a meal. Just make sure to use perfectly ripe avocados (unripe ones tend to get a bit lumpy in the blender, and too ripe ones have that weird, sweet taste that no one likes). You’ll swear that you put a scoop of ice cream in your smoothie, it’ll be so velvety smooth. Enjoy! Combine all ingredients, including the honey, if using, in the basin of a blender. Blend on high until very smooth and creamy. Pour into two glasses and enjoy. If you have a nice and sweet banana, you might not need to add the extra honey. Sweeten to taste. This post is sponsored by Pink Ribbon Produce. To learn more about Pink Ribbon Produce, visit their website or follow along on Twitter, Facebook, or Instagram. All content and opinions are my own. It’s Thursday not friday. I do too hope it’s the last day of the week. 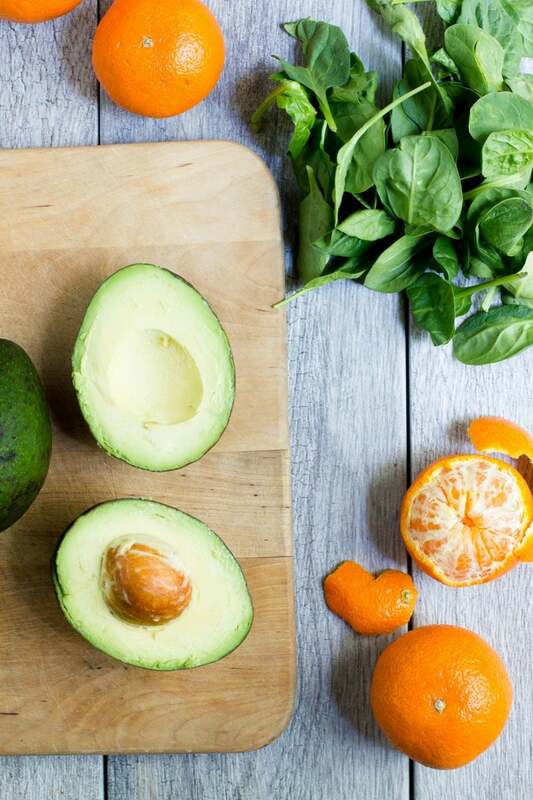 I love the creaminess that avocados add to smoothies and this combo sounds extra delicious. Can’t wait to get my hands on some clementines. though this may be unusual, it actually sounds amazing! It looks so darn creamy and filling! i love avocado as a base for my smoothies. make it so smooth and the color is just gorgeous! I eat avocados on toast nearly every day for breakfast! Time to shake things up—and your smoothie looks like a fabulous option! I am all about this gorgeous smoothie!! And I even have both avocados and clementines on hand!! What a gorgeous smoothie! It looks insanely creamy. Mmm, creamy, citrusy, looks perfect to me! How does this smoothie hold up if not drank immediately? Does it brown like an avocado that has been left out does? The citrus will help keep the avocado from browning for a bit, but I wouldn’t let it kick around for more than a day or so. You really should include a quality, plant-based protein in your smoothies. These are almost all carbs and, except for the fiber, will be quickly processed by the body and the sugar into the bloodstream. Almond and coconut milk doesn’t have much protein and cow’s milk should just be eliminated IMHO. Garden of Life makes several fantastic flavors that I have used and will help keep you full and not spike blood sugar levels. every bit of it and I have you saved to fav to check out new things in your website.